Andhra Pradesh is the only state that claims to have calculated exact timber and bamboo revenue shares transferred to communities under JFM. The World Bank funded the programme with generous loans of Rs 1,000 crore for 15 years till March 2009. Benefits shared are impressive. According to the World Bank’s assessment of July 2010, each forest protection committee has been earning between Rs 1 lakh and Rs 4 lakh every year from timber thinning operations. Gross revenue from bamboo harvesting in the project period has been Rs 825 lakh. In addition to this, since 2006 the forest department has transferred Rs 39.5 crore, the total revenue from selling beedi leaves, to the committees. Among the five states leading in JFM work, communities have earned the highest in Andhra Pradesh. Since 1996 the entire net revenue from all forest produce is distributed among members of forest protection committees (or Vana Surakhsa Samitis, VSSs) in the state. Earning from timber in plantations raised under JFM is shared using a different mechanism. This is dependent on the timber species’ rotation period, that is the time required for the species to reach a size at which it can be harvested. If a community has managed the plantation for more than half of the rotation period, it gets all the net revenue. Half of the community share is given to members and the rest is used for village development. But the impressive story fizzles out as one enters villages with substantial JFM forests. “They (the forest department) will steal the hair off our heads if we let them,” says C Kothanna, miming the act. 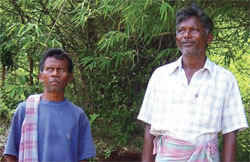 Kothanna is former president of Vankachinta village’s VSS in Visakhapatnam. He is referring to the forest department’s lack of transparency in sharing benefits under JFM. 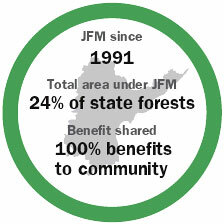 Since JFM began in 1994, the department has harvested bamboo once, three years ago. “We got Rs 27,000 for two truckloads of bamboo. We were not told how much the bamboo sold for,” says Kothanna. In several villages, people claim, the department often denies permission to cut bamboo. When they do give permission it is at the wrong time. “Last year we got permission to cut bamboo during busy farming season,” says K Nageswara, VSS president in Vankachinta. This despite the village getting community rights over the JFM forest under the Forest Rights Act (FRA) in 2010. The right gives them full control over bamboo. While the forest department claims benefit sharing as per the rule book, people feel otherwise. “We don’t know how much is in the VSS bank account. The department keeps all the documents,” says Koppala Arjuna, VSS member, Shrikrishnapuram, Visakhapatnam. Within two years of the World Bank funding coming to an end, the JFM programme is on shaky ground. Pace of work has slowed, forcing the state to tap into the National Rural Employment Guarantee Scheme to keep it going. The fund crunch has led to resentment. Some have started to cut trees on the sly. The State Forest Report of 2010 bears this out. It shows a net loss of 33 sq km of forest cover in JFM areas and 3,300 ha of good forest turning degraded between 2007 and 2008. Others have taken decision-making into their own hands. “We planted cashew though the department protested,” says Vengala Pedaraju, former VSS president, Shrikrishnapuram. In Shrikrishnapuram and Dabbanda villages on the outskirts of Visakhapatnam, tired of waiting for the permission, people have started cutting down bamboo in small quantities without telling the department. This area falls within the proposed Kambalkonda National Park and that is why the permission is denied, says P Devullu of Sanjeevani, a non-profit that works on forest-related issues in the area. “We have been nurturing these eucalyptus, teak and casuarina plantations since 1995. Then in 2002 they declared it a protected area, so we cannot reap the rewards of our hard work,” complains D Venkatesh, secretary of the village committee formed under FRA in Dabbanda. These villages are demanding they be compensated for the revenue lost due to the area being declared protected.